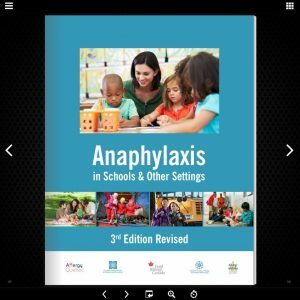 The Canadian Society of Allergy and Clinical Immunology (CSACI), in collaboration with Food Allergy Canada and others, released national guidelines for Canadian schools for anaphylaxis management. 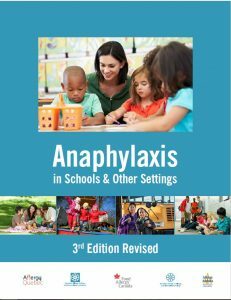 The guidelines, Anaphylaxis in Schools & Other Settings, 3rd Edition Revised, includes key recommendations, based on the latest research, for the management and treatment of anaphylaxis in the community. Download the guidelines now, or peruse the flip book. Download the guidelines in English*. Download the guidelines in French*. A digital version providing page flip animations and sound, thumbnail views, and enhanced search features. Be sure to share your, or your child’s, Anaphylaxis Emergency Plan with caregivers, teachers and coworkers. This vital information should be available in an emergency. Download your copy today! Note: These resources are for educational purposes only. Refer to the Copyright page of each document for additional information.